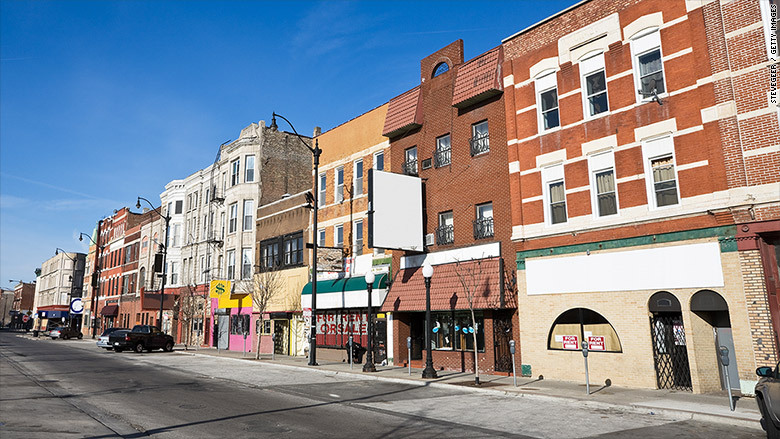 A strip of businesses in southwest Chicago. Marketed as a fast way to access cash, merchant cash advances can help some entrepreneurs get out of a tough spot -- but consumer advocates and government officials say that too often, that's not the case. Here's how they work: Typically offered by credit card processing companies, a merchant cash advance is a lump sum of cash taken out as an advance on a borrower's future sales. Typically, the borrower then pays back this balance -- plus a hefty premium -- through automatic deductions of their daily credit card or debit card sales or from the business' bank account. Woodstock Institute, a nonprofit research organization, analyzed a number of merchant cash advances and found that borrowers often end up paying effective interest rates that can soar into the triple-digit percentages. In one case, a provider gave an advance of nearly $24,000 to a business, charging more than $1,100 in fees for things like issuing the advance, risk assessment and processing. To collect its payments, it deducted $499 a day from the business' sales for 76 days. In total, the borrower paid nearly $37,500 -- paying an effective interest rate of about 346%, according to Spencer Cowan, an executive research consultant for Woodstock Institute. Cowan testified about this before a Senate banking committee in January. If businesses can't keep up with the payments, things can go awry quickly, said Eric Weaver, CEO of Opportunity Fund, a community development financial institution, or CDFI, based in San Jose, California, that provides loans to small businesses and individuals in low-income communities. CDFIs are certified and supported by the U.S. Treasury Department. The automatic deductions will continue as long as there is money for the cash advance company to withdraw. Many business owners take out new advances in order to pay off outstanding balances on previous advances, plunging them into a cycle of debt. "Many go out of business," Weaver said. Joe Ruvacalba, a Latino entrepreneur from Rancho Cucamonga, California, started his own plumbing company four years ago with just $10,000. But cash flow soon became an issue. "You start a job, but your first client check might not arrive for 30 to 60 days. But you still have to pay for labor and material and everything else," he said. None of the banks would give him a loan so he resorted to a merchant cash advance. The first one was for $50,000, on top of which he says he paid another $20,000 in fees and other charges. "I had to pay that one back in six or seven months," he said. Without being able to secure a business loan from any bank, Ruvacalba said the only way for him to grow his business, keep on top of his payroll expenses and pay back his previous cash advance was by securing more merchant cash advances. "At one time, we had five of these loans," he said. "And I remember we were paying about $5,000 daily." In total, Ruvacalba took $700,000 worth of merchant cash advances, costing him roughly $200,000 in fees and interest. "As an owner, you have to ask yourself: 'Can I handle this payment every day?' And if you can't, don't get it," said Ruvacalba who paid off the advances over the course of four years. Despite how much it cost him, Ruvacalba doesn't regret his decision. "I'm not going to badmouth somebody that was willing to help me when the banks weren't," he said. Securing traditional loans from banks has been a particularly tough issue for black and Latino business owners, said Lauren Stebbins, senior associate for small business initiatives at Opportunity Finance Network, a nonprofit aimed at educating small businesses about financing alternatives. After struggling to secure a loan, Terry Baggett, owner of Chicago-Springfield Insurance, took out a merchant cash advance. "Black and Latino businesses are denied credit by banks at a higher rate than white-owned businesses, so they go to alternative financial products offering easy, fast financing," said Stebbins. The problem is the advances aren't regulated by the government and the fees, penalties and rates aren't subject to any oversight. In addition, the terms of the advance aren't always clearly outlined and the total amount owed -- including the hefty fees and charges that are tacked on top of the initial advance -- isn't usually expressed as an annual percentage rate. "They may not know what they're getting into because those providers aren't required to disclose their terms," said Stebbins. 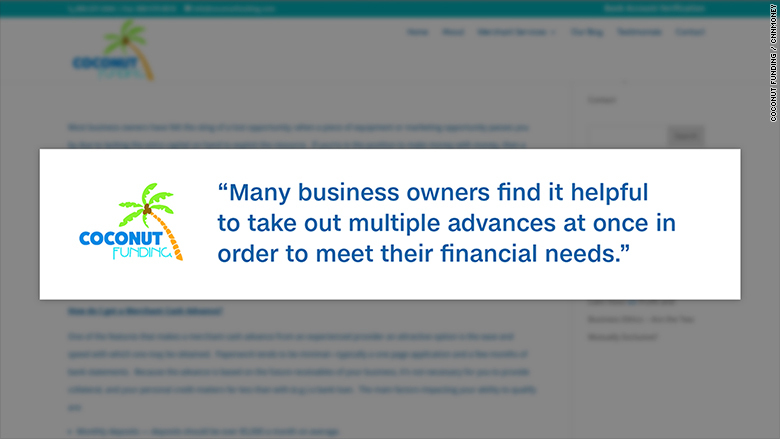 Another problem: After a business owner takes out one advance, they are often bombarded with offers for more. In early 2015, Chicago Mayor Rahm Emanuel denouncing the merchant cash advances in a press release, noting that providers have "accelerated their marketing efforts, resulting in numerous small businesses taking loans they cannot afford." The city has also unveiled two city-sponsored lending alternatives for community businesses. 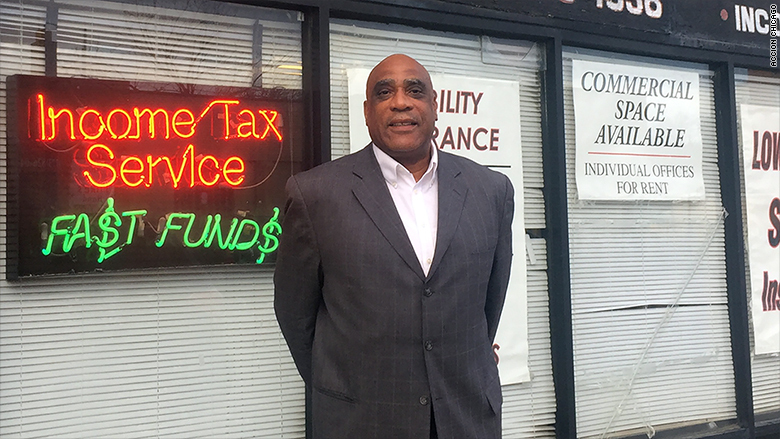 Terry Baggett, an African-American entrepreneur who owns Chicago-Springfield Insurance in the city's Humbolt Park neighborhood, where his family has operated for 50 years, took out a $12,000 merchant cash advance for the first time last year. Since he took out the advance, he's been getting calls pitching new advances every day. "They're throwing money at me," he said. "One guy from Coconut Funding said I could buy a boat with it." CNNMoney reached out to Honolulu-based Coconut Funding. A man who identified himself as the company president declined to comment for this story. Baggett pays $180 a day in order to pay off his advance and says he doesn't plan to get another one. "In the long term you have to look at how much money is going out," he said. "I hope that once my cycle catches up, I won't even have to deal with these guys anymore."